e-Commerce business is increasing day to day. It has created opportunity for everyone to start online business with little investment. Many people are not aware that starting eCommerce business require steps and decision to work together at right time. Like offline business, online business also have some advantages as well as disadvantages. Review the pros and cons of e-Commerce business. You may also like to read "How to Guide to Create ​Mobile ​Responsive ​Design". Unlike e-Business, offline business have certain limitations to reach the customers. In e-Business owner can target the whole country at the same time and takes the lead on offline business because whole world is its playground. There are limited customers for offline business. It cannot cross the limit. But on the other side Online business targeted area is too big. It receives new customers from Search Engine and other different methods. e-Commerce business is time saving for customers, they don't have to travel to purchase a products. Online business doesn't require a physical store and hence saves the cost of establishing a physical store. For users, it becomes easy to visit online website to purchase product instead of visiting physical store. Offline business requires good amount to setup a business. But eCommerce business can be started with a little investment. If a person does not have any website, he can sell his products on various eCommerce portals available online as there are so many Ecommerce store development companies like shopify offering affordable and ready to use eCommerce portal. Offline business builds the relationship with its customers personally. But on the other side e-Commerce business missed this important part. In offline business user visits again to the store because of personal touch, but not the same with online business. Internet is the life of eCommerce business. Once the internet is down it will miss all the sales. It is like no internet no revenue online. But offline business never faces this types of issue. Shopping carts and payment processing are very important parts of any eCommerce Business. But sometimes, a little technical bug can create issues in website and website stop working. Hence, it won't do any conversion until that issue get fixed. In online business business owner have to take the responsibility of products even after its delivery. If user is not satisfy with product he received, he will return it to the owner and owner have to refund the amount. Well with this article we may conclude that every business has advantage and disadvantage. 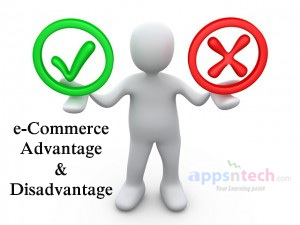 Although we cannot avoid disadvantages but certainly, we can take measure to manage risks and get abundant advantages from eCommerce business. Advantages are undoubtedly teasing, and we will appreciate such simple exchange nowadays. It is suggested that always try to manage risks before it hinders your online business. Appreciate more your web searching and appreciate more your e-business exercises!